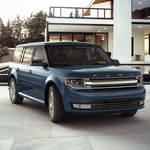 Discover All the Ways the Ford Flex Can Keep You Comfortable | Randy Wise Ford Inc.
Have you ever climbed into a vehicle that you thought that you were going to love only to have it be so uncomfortable that you couldn't stand being in it? If you are looking for comfort in the midsize SUV that you purchase, check out the popular three-row option from Ford, the Flex. It is easy for passengers of the Ford Flex to climb into the vehicle because of the way that this vehicle sits. No one has to struggle to get up and into this vehicle, and that helps everyone start out comfortable before they even take a trip in the vehicle. The front seats of the Flex can be heated and they can be cooled in order to keep you comfortable as the driver of this vehicle. You can choose how you want the seat to help you adjust to the weather that you are dealing with, and if you want it to help you out or not.